Homeowners in the “sinkhole alley” area of Hillsborough, Pasco and Hernando counties could buy expanded insurance coverage under a bill filed by Sen. Jack Latvala, R-Clearwater. The bill, SB 1274, filed last week, would once again allow insurance companies to offer homeowner protection for sinkhole damage that is deemed less than catastrophic. Looking to rein in the large number of claims being filed, some of them bogus, state lawmakers in 2011 approved a measure to restrict coverage only to the most serious structural damage to homes or businesses. The 2016 session of the Legislature opens Tuesday. But when the law took effect in 2012, insurance companies could no longer write policies covering lesser structural damage like sunken floors and cracked walls. Homeowners in the "sinkhole alley" area of Pasco, Hillsborough and Hernando counties could buy expanded insurance coverage under a bill filed by Sen. Jack Latvala, R-Clearwater. 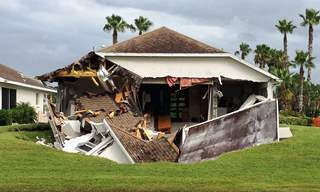 The industry, represented by the Florida Association of Sinkhole Specialists, supported Senate Bill 408 back when it was introduced because they saw that the insurance companies were losing millions on fraudulent filings. But it went too far in the other direction, Flynn said. The 2011 law did succeed in reining in the number of claims. Citizens Insurance reported that since the law took effect in 2012, claims fell by more than 60 percent. More than 4,500 claims reported in 2011, 3,100 in 2012 and 1,200 in 2013. Latvala’s bill would allow companies that might want to cover that damage to offer those lines of insurance coverage for less than structural damage. “Sinkholes are a way of life in the state of Florida. There should be coverage at an affordable rate with reasonable boundaries at what should be covered, “ said Ted Corliss, a property insurance lawyer who represents owners against insurance companies over claims disputes. The pendulum went too far in the direction of the insurance companies, Corliss said, and he is glad to see Latvala pushing back to provide more consumer protection. “The 2011 law put a lot of people at risk, creating a dangerous situation where they couldn’t get coverage,” Corliss said. Hillsborough, Pasco and Hernando counties have been dubbed sinkhole alley because of a disproportionate number of sinkholes and sinkhole damage. Two-thirds of sinkhole damage reported to Office of Insurance Regulation 2006-10 came from those three counties. The value of sinkhole claims across the entire state was $1.4 billion for 2009-11. Latvala said his home in Fox Wood at Trinity in Pasco County cost $50,000 to repair after a sinkhole opened up nearby several years ago. He was covered. Sen. Wilton Simpson, R-Trilby, introduced a bill in 2014 to create a sinkhole repair program under Citizens Property Insurance Corp., the state-run insurer of last resort, but was told it didn’t go far enough to protect homeowners. Critics said it could lead to unscrupulous practices by contractors, while others said it should be open to more insurance companies than just Citizens. Under Latvala’s measure, providing sinkhole coverage would be voluntary. Before the law’s rewrite, it was mandatory. Also, people who get an insurance payout must spend it on repairs and not to pay off mortgages or buy fishing boats, as was documented in years past. “We are a proponent of this legislation just because we would like to see people who have legitimate problems have the means to repair them,’ Flynn said. The average sinkhole repairs run around $50,000 to $60,000, he said. And it will help the neighbors surrounding a sinkhole-damaged home, he said. Unrepaired sinkholes and sinkhole damage drives down the value of other homes substantially he said.